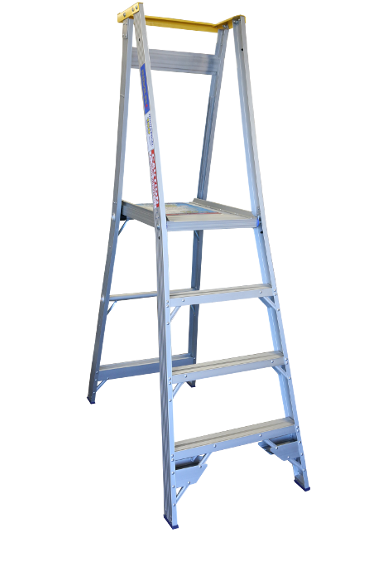 Ladder Solutions offer the widest and the most complete ladder range in Australia to cater to various demands from the requirement of heavy duty industrial ladders for use at construction sites to ladders for use by DIY or householder. The Indalex range of platform ladders have been tailor made to incorporate safety and quality into the design. With a 3ft high handrail, waist high support and a solid platform to stand on, your work becomes easier and more comfortable. If you have a job that requires a specialty ladder, we can make it, Ladder solutions has a well equipped workshop in Sydney where customized ladders, work platforms and ladder modifications are easily preformed, no job is too big or too small. We pride ourselves on having high quality ladders, made from Structural grade aluminium which gives you high strength yet lightweight components coupled with the fact that all aluminium components are Anodized for superior corrosion resistance and a clean to the touch finish, Indalex ladders are ladders you can rely on.